This is a good looking timber shed that has durability built into it, so you can have peace of mind that it will be just as aesthetically pleasing in many years’ time as it is on the day it’s installed. It even comes with a 15 year manufacturer’s warranty against rot, which is far in excess of that given with many other timber sheds we review. 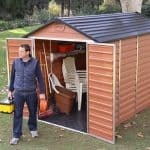 The reason such a long warranty period can be given is that this shed offers excellent weather protection. The apex roof is the first line of defence from rain and snow, but this is also helped by strong tongue and groove cladding. We were pleased to see this used on all surfaces, including the felt covered roof, and not only on the walls. It was also good to see pressure treated floor joists included, giving protection against ground moisture. Of course, sheds today need protection from more than the weather. That’s why we were glad to find that the large doors were fully braced and secured with a good quality key operated lock. The windows, too, were stronger than many we see. The result is that your contents will be kept safe, as well as dry. 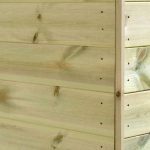 This shed has all the charm of a traditional timber garden building, but it makes the most of modern developments in shed technology by using tongue and groove cladding that has been pressure treated with high quality wood preserver. 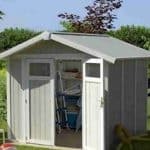 We could tell that this shed has quality running right through it from the moment we say, and this initial impression was only confirmed as the review progressed. For a shed of this size, we always like to see an apex roof as this is the most effective way to stop water ponding on the surface. It not only achieves this, it also gives the building even more height which is always useful in a storage facility. The ridge height is 2.31m and the eaves height is 1.72m. When finding a place in which to install the shed, bear in mind the overall width of 2.44m and the overall depth of 3.02m. With modern sheds in this price range, we are used to seeing shiplap tongue and groove cladding used on the walls, yet we sometimes find that OSB has been used for the roof or floor which whilst it saves on production costs can also impact upon the overall durability. That’s why we were pleased to see 12mm cladding used throughout the shed. We have seen thicker frames than the 34 X 34mm used here, but it still results in a structure that feels strong and sturdy. The floor should be strong enough for most purposes, although you may want to reinforce it if you plan to store machinery or maybe a motorcycle inside. We were very pleased to see pressure treated floor joists integrated into the floor. The elevation they provide reduces the risk from surface moisture, and this should increase its durability. Because we were impressed by both the cladding and the pressure treated floor joists we would expect this shed to prevent rot for many years. This is especially true as pressure treatment has been used on all the timbers, a process that ensures deep seated and long lasting preservative qualities. 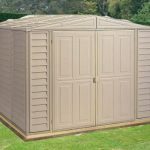 We were pleased to see that the manufacturer is in agreement with us over the shed’s durability, and that they’ve backed this up with a 15 year warranty. This is at the very top end of warranty periods we find, and there is not even any emphasis on the customer treating the shed annually. We would, however, recommend inspecting it on a regular basis and adding more wood preserver if necessary. The hinged double doors were a feature that really caught our attention, as they are significantly wider than most we review and were also tall enough that people won’t have to worry about bumping their heads. The opening width is 1.54m, or five foot, and the opening height is 1.80m. This is why we can easily imagine it being used as an all weather motorcycle store, with the addition of a ramp. It was good to see two windows supplied as standard, as natural light is essential for sheds that people may be spending a lot of time inside. They can also be positioned one on either side, or both on one side. We were also pleased to find that they open, rather than being fixed, as this allows ventilation and temperature to be easily controlled. Shed security is very important, so we were pleased that the windows feature toughened safety glass to give it initial protection against attempted break ins. 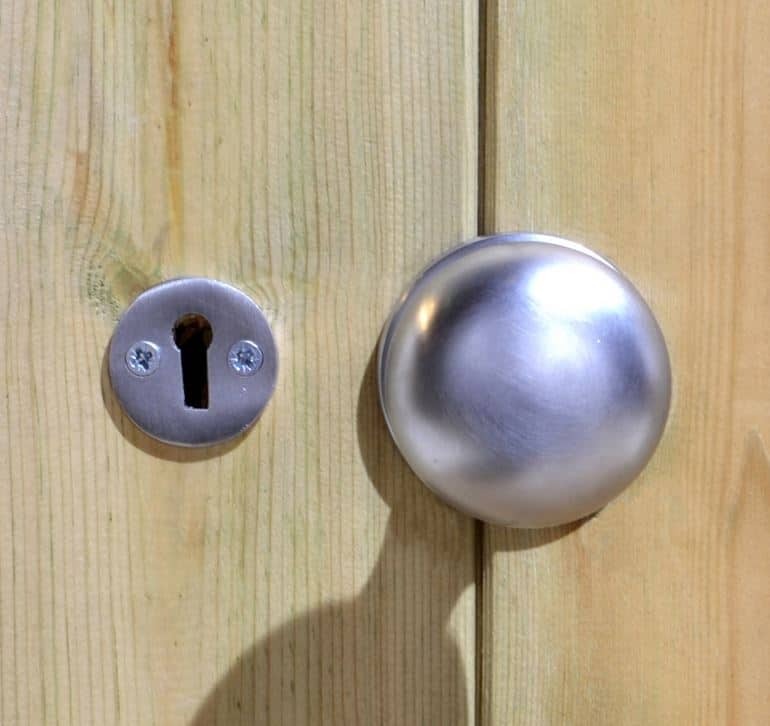 Security is further enhanced by the inclusion of a key operated lock. 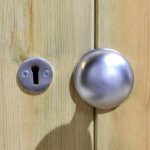 This is a feature we always like to see, as it’s a foolproof and reliable locking system, although many sheds we review come without locks of any kind. 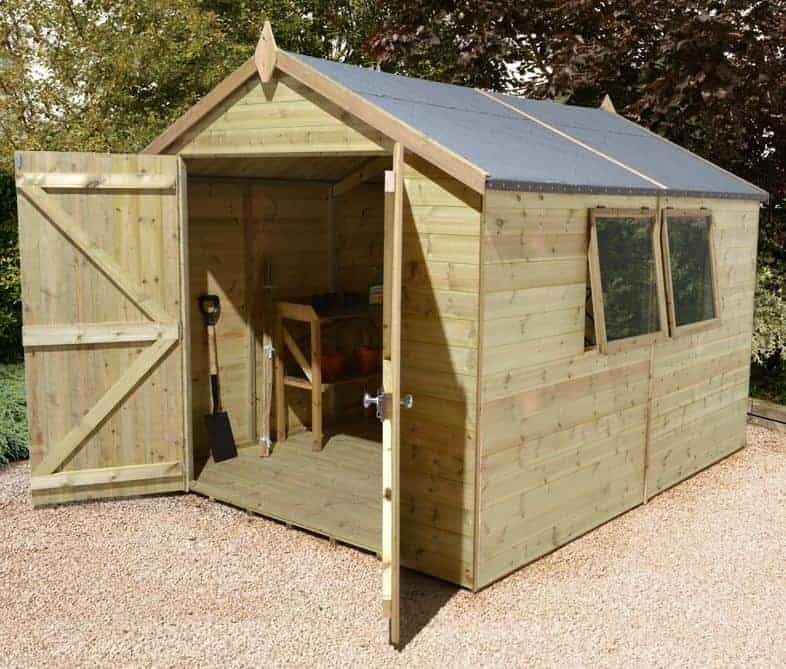 There is a varied range of optional extras available with this shed, which is something we always like to see. For example, a slatted roof is available which can give added protection, although it does significantly add to the initial cost at £309.99. More affordable, and even more useful, is a tough and stylish workbench at £106.99. We have a lot of experience in assembling sheds, but we can understand how people thinking about assembling a shed for the first time may be put off by the large number of components and sometimes convoluted instructions. That’s why it’s good to see that a professional installation service is available for £149. 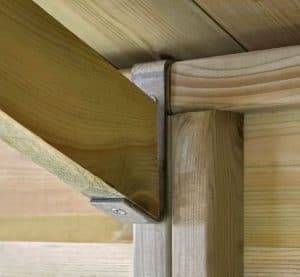 The use of tongue and groove cladding across all the surfaces shows the attention that’s been paid to quality, even though the frame could have been slightly thicker. Pressure treated smooth planed timbers have excellent resistance to water and rot, which is why such a long warranty period can be offered. 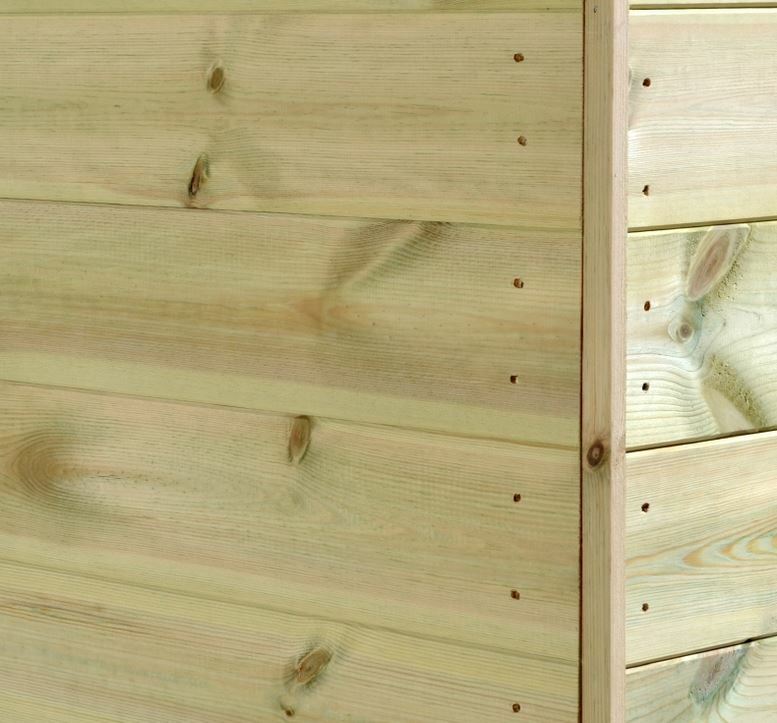 Unlike some other sheds we review, the height is just as generous as the width and depth. This means that a lot can be stored within it, especially as the large double doors make it so easy to take objects in and out. As you’d expect in a shed of this size there are a lot of components, many of which look similar. Whilst two people can complete the installation in around four to six hours, we can imagine many people utilising the professional installation option. 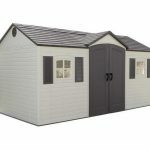 Whilst this shed may be out of the price range of people operating to a tight budget, it’s good looking, has a more than adequate storage capacity for most small to medium gardens, and should be very long lasting. Final Thoughts: If you’re looking for a top quality timber shed that costs less than a thousand pounds then we can highly recommend this one. It has many features that impressed us, not least the very long 15 year warranty period against rust which shows just how effective the initial pressure treatment must be. We were almost as impressed by the doors, their wide and tall opening means that it’s simplicity itself to move objects of any shape or size inside, which is one reason why we feel this would be suitable as a small workshop, especially as a key operated locking system comes as standard. Hi. 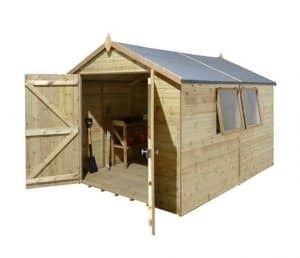 I was very interested in purchasing a Champion Heavy Duty’ shed from ‘The Shedstore’, but was disappointed to discover the manufacturer does not deliver to my TR postcode area. What makes this so frustrating is I’m convinced the inclusion of TR in the areas not covered is an error. All of the others in the list are, or on, islands (Belfast, Jersey, Guernsey, Isle of Man, etc.) and I firmly believe the inclusion of TR is based solely on the fact that is also the postcode for the Isles of Scilly. However, TR covers most of Cornwall, it stems from Truro, the capital city of the county, but I suspect the ‘list maker’ has not realised that. They DO deliver to PL, which is Plymouth in Devon, the next county to Cornwall, and a chunk of Cornwall is covered by PL, so some people who live in this county can get delivery. The lowest part of the PL area and the highest part of TR are just a few miles apart. It doesn’t make sense, so I remain convinced it is the Isles of Scilly that has prevented me from being able to purchase one of the Champion Heavy Duty sheds. 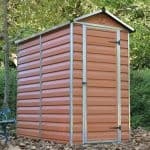 PS in your review for this particular shed, you say there is a 15 year warranty against rust. Are you sure you don’t mean rot?! Thanks for the update we do me rot not rust.